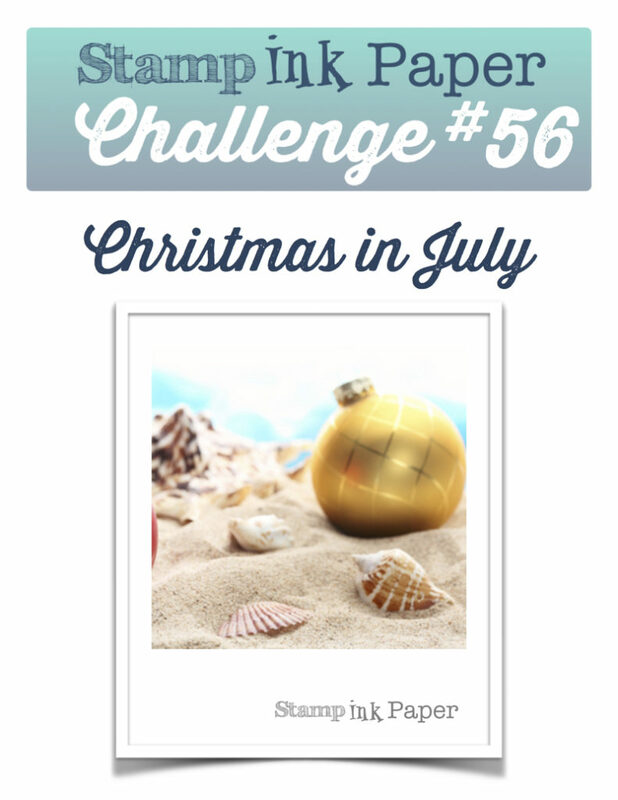 SIP Challenge 56 – Christmas in July! Home / Blog / SIP Challenge 56 – Christmas in July! Another crazy Monday! The morning started off with a visit from Taylor and Kiera at 8:00AM! That’s a little too early for company! I do like to have my mornings to myself. I hurried to get ready and left the house around 9:00 to head over to the Stamp, Ink, Paper Store. Once there I settled in to get my Newsletter finished and out! It was done by 11:00! Yay! The rest of the day I spent making parts for upcoming projects. I need to get into the habit of doing that! Renee left a little early, she’s still not 100%. Once 7:00 rolled around it was time for me to go. It was in the 70’s which makes for a very nice top down ride home in the car! When I got to my Parent’s my little buddy Daniel was there along with my Brother and Erika. She thinks that today is the day! Fingers crossed that all goes well. After my little visit with them Heather came by and her and I ran to Target. She is going to have a procedure done on her back this morning. Fingers crossed for her too! I have a bunch of orders to get in for the store and some more projects to finish! Always a busy but great day! This entry was posted in Blog, Cards, Crafts, Embellishments, Hero Arts, Lawn Fawn, Photopolymer, Pretty Pink Posh, Ranger, Stamps and tagged Card Making, Crafts, Hero Arts, Holidays, Lawn Fawn, SIP Challenge. Bookmark the permalink. Wow! That is some great inspiration for making Christmas cards early. I love your card. Yes, the soft blue really adds the subtle touch needed with the beautiful bright poinsettia flowers. I love the font of the sentiment. I’m keeping my fingers crossed for Erika that today is the day. I’m sure she is ready to pop. So glad you got another chance to drive with the top down. Have a great day, Justin. Justin, I am not ignoring you! I like your use of the oval cut and, of course, the sequins! Different color (light blue) for a Christmas card, but you, as always, make it work. Last, Erika, I will keep you in my thoughts. You have a great family support group with Justin’s family so close by. Thanks Nancy! Heather did well! My Mum is having back issues too and so is Brian. You guys could all form your own support group! LOL! I know that you aren’t ignoring me! I’m glad that you like the card! Erika is a mum again! Yay! I really do think your card is just beautiful. I would not have thought Soft Sky would work for a Christmas card but you prove me wrong once again! In addition, making the oval cut out off center really looks amazing. For some reason I always seem to feel I have to center the cut. All in all it’s just a fabulous Christmas card that I may have to CASE. Normally I am really good about making 10 Christmas cards a month so that is one less thing I need to think about when the holiday actually comes. For some unknown reason, I haven’t made a single Christmas card this year and it’s already July! I should have 70 made already. Yikes! I didn’t realize how bad I’ve been until this very second when I actually saw it in writing. Now I have to go sit in the corner and give myself a 10 minute time out for being such a bad lady! Shame on me. Hazy, hot and humid here today. The kind of weather that makes it hard to think about Christmas cards for sure. I don’t like this weather at all so I will hang out in the house with the A/C droaning on and on. I went to the blog and saw that Michael had a card there. Haven’t heard anything from him in ages. All the cards on the blog are really lovely. Thanks so much! 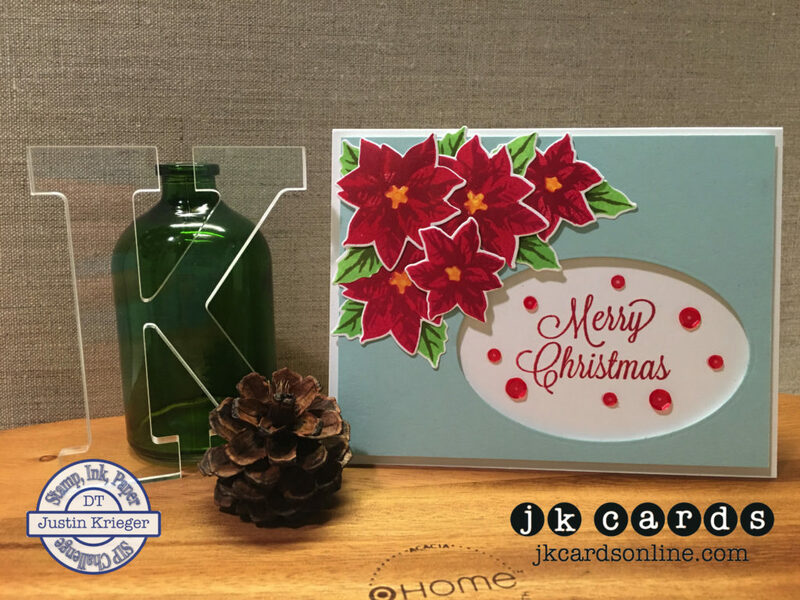 I love blues for Holiday cards! Reminds me of the cool weather of the time! I like when things aren’t centered! A little off kilter just like me! LOL! I am terrible at keeping up with my Holiday cards! I need to get much better at it! Yes, Grace, get on those cards! Yes, I know that it’s a good day for you to stay inside in the AC, I however love this weather! Yes, it’s nice to have Michael back! Love this, even with the blue background. Everythng works. Fingers crossed for the new arrival.